How Do I Become an Ethnobotanist? Ethnobotanists study the relationship between cultures and plants. There are a number of approaches someone can take to become an ethnobotanist. All of them involve pursuing a college education and many require students to obtain an advanced degree. Becoming an ethnobotanist takes a lot of work and commitment, but is also very rewarding, once people successfully complete their education and training. 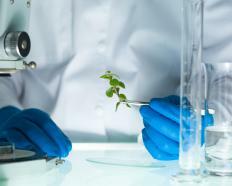 Once qualified, an ethnobotanist can work in a range of fields, depending on what he or she is interested in, from pharmaceuticals to anthropology. Ethnobotany is a field which studies the relationships between humans and plants. This field is quite broad and sometimes ill defined, including topics like plants used in traditional healing by tribal peoples, the history of agriculture, superstitious beliefs about plants, plants which can be used for dyes, plants utilize in textiles, and so forth. Because the field is so broad, people can approach ethnobotany from many angles, making more than one way to become an ethnobotanist. A small number of colleges and universities offer bachelor's degrees in ethnobotany, with more schools offering graduate level work in this field for people who want to become an ethnobotanist. Students who are interested in particular topics, such as discovering new pharmaceuticals or learning about traditional native uses of plants, may want to do some research to see the kind of coursework various ethnobotany programs offer, and the type of research being done by the faculty. It is also possible for a student to create a customized degree in ethnobotany by working with academic advisors and college staff. Someone can become an ethnobotanist through disciplines like general botany, anthropology, sociology, molecular biology, pharmacology, and biology, among other things. Students who are interested in taking this tack should talk with schools they are interested in attending to see if the school will allow the student to create an ethnobotany curriculum, and if the school has the logistical support to help the student. While in school, students should plan on pursuing internships and other ethnobotany opportunities. Someone who wants to become an ethnobotanist can get a head start by doing summer research with working ethnobotanists, helping to catalog botanical collections, participating in anthropological research to learn more about working with tribal populations, and so forth. This experience will also be useful when the student pursues a job in the field; he or she may be able to turn a summer internship into a career, or use work experience as a resume item to make a potential employer more interested. What Does a Phytotherapist Do? How do I Become a Plant Breeder? What does an Ethnologist do? How do I Become a Botanist? What are the Different Anthropology Careers? I studied as an undergraduate in Ecology, and am going to do my postgraduate work in ethnobotany, as there were no universities in my country that had any ethnobotanical undergraduate options. I don't know what country you are in, but you can look on the net to see what undergraduate courses the universities in your area offer. As long as they are vaguely plant-related, you can turn it into an ethnobotanically-based postgrad degree, but if you can get any undergrad courses in botany or ethnobotany that would be better. I would seriously recommend doing volunteer work with any botanically-focused organization while you study, especially try to get into any summer research programs, as these will give you an advantage over any graduates that didn't. Thank you so much! I appreciate how informative this is because I want to become an Ethnobotanist, but I'm unsure of what, specifically, I should take in universities that are directed solely for the purpose of ethnobotany. I would also like to know if you have suggestions for universities and/or colleges that have a strong educated faculty dedicated to ethnobotany and other courses pertaining to the career. I would appreciate it if you could list down any universities/colleges that offer degrees into Ethnobotany. That'd help a lot, thanks!